Welcome to The Loopy Crab, your neighborhood vacation home away from home. This newly updated beach home is full of color and beachy décor that makes it impossible to forget you are staying in paradise. The main floor open concept allows for family togetherness and shared experiences. Six adults can all sleep comfortably in king beds while the kids have their own bunk room. The first floor bath features a walk-in shower. The master bath has a walk-in shower, double sinks, and a jetted tub. The guest bathroom on the second floor has separate his and hers sinks with a makeup vanity in between. A third floor tower room with a cozy couch, and balcony provides a place to view the sunsets and rooftops. Directly out the back door you will find a large private pool with plenty of room for the entire family. There is also a poolside table; perfect for family dinners. Plenty of parking is available with room for three cars in the driveway. The Seacrest community features a 12,000 square foot lagoon pool and amphitheater. If you can get the children away from the pool, hop on the complimentary tram for a quick shuttle to the beach. Eat lunch on the Gulf at Crabby Steve’s, one of the few sandy front restaurants in the area. Take an enjoyable bike ride to Peddler’s Pavilion, Alys or Rosemary Beach for many dining and shopping options. 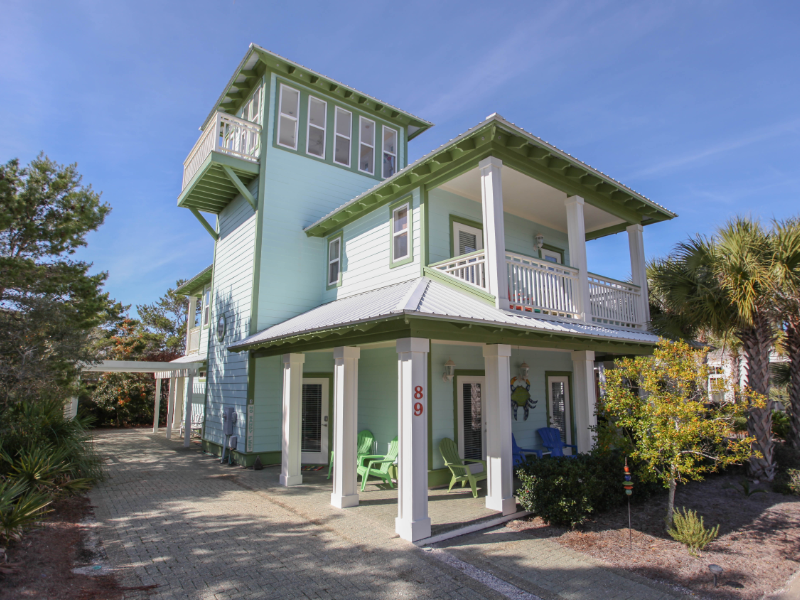 Stay at The Loopy Crab and discover why Seacrest Beach is a favorite among families.